Ceramic flooring is a popular choice in many homes. It's durable, easy to clean, and has a sophisticated look. Ceramic flooring is also very versatile as it's available in many different sizes, shapes, textures, and colors. Ceramic tiles in particular are very versatile because they can be laid out in an unending number of different designs. Why Choose Ceramic for Flooring? There are a few reasons why using ceramic for flooring is so popular. It's a hard surface that's easy to clean (mild soap and water is usually enough) and stands up well to scratches and scuffs. It keeps its appearance and doesn't fade over time. Ceramic floors are resistant to moisture. Ceramic tile works well with radiant floor heating which is becoming very popular. Ceramic floors can be reasonably priced and will add to the value of your home. The more intricate the design the more expensive it will be, but its durability will ensure that it will last for many years. 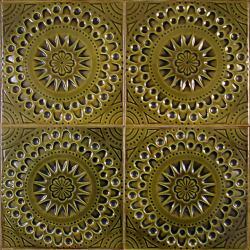 Ceramic tiles offer a limitless variety of looks, styles, colors, and designs. There are several different types of ceramic floors, with the two main varieties being glazed and unglazed (there are varieties within each category). The glazed version is usually more desirable because it's more durable and resistant to moisture and damage than the unglazed variety. Glazed tiles come in a few different finishes including high-gloss and matte varieties. When it comes to flooring, matte is usually more desirable since high-gloss tiles can become slippery when wet. There are many advantages to choosing a ceramic floor, but there are also some important things to keep in mind. Ceramic floors are hard and are not comfortable to stand on for long periods of time. They're also not easy on breakable objects. If you drop something fragile on a ceramic floor it will break. 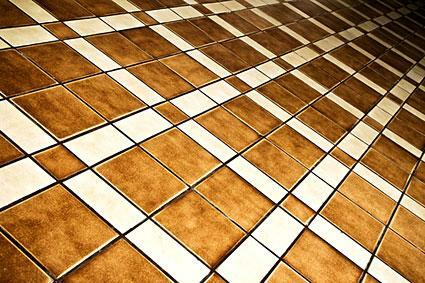 If tiles break or crack it can be difficult to find replacement tiles that are a perfect match. If it fits the budget you may want to buy a few extra tiles just in case. Ceramic does not cushion sound in any way. 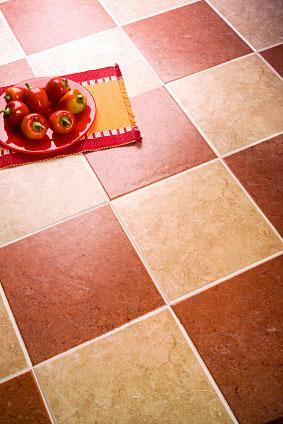 Rooms with ceramic flooring can become noisy. Ceramic floors (without radiant heating) can feel very cold to the touch in environments with low temperatures. Laying a ceramic tile floor is a big job, but one that many handy DIYers can accomplish. However, it requires quite a bit of patience and prep work, so if you're not up to the task it's advisable to hire a professional to get the job done right. Ceramic tiles are available in many different sizes and many different price points (from a few cents to several dollars a piece). The sizes range from around one to 24 inches square, with most being between 12 and 18 inches square. There's lots of room for creativity when it comes to ceramic tile layout and design. Aside from the larger tiles, small mosaic tiles are also available (frequently sold in sheets) and can be used to add visual interest to the floor. Designs can be a combination of sizes and colors, and just about any look can be achieved. Remember that the more intricate the design the more complicated the laying process will be. If you want an interesting design it may be worth hiring a professional to make sure the job is done correctly. While the labor can add significantly to the cost, the result will be worth it. Ceramic flooring is practical, durable, and attractive. If you're thinking of redoing the floors in a kitchen, bathroom, entryway, or hall, you might want to consider installing ceramic tiles. They look great and will add to the value of your home.